Hand pruning is in full swing at the vineyard. With 32 1/3 acres to prune, we have to book it to get finished before bud break. A typical day for us from now until we are done is being out in the vineyard around 9:00 am and working until 5:00 pm. We do stop for breaks after finishing a row. Lunch is at 1:00 and this year we are eating it in the vineyard. Hand pruning needs to be finished before the buds begin to break (or open) for a couple of reasons. 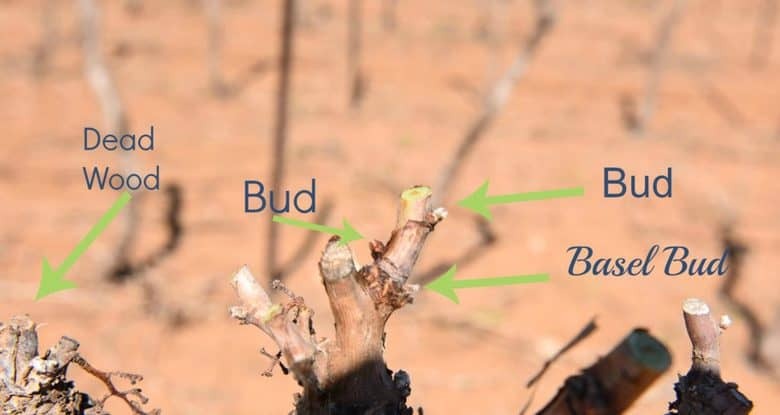 First, the grapevine uses a lot of energy to push the buds and if those are buds we are going to cut off, it is a waste of the plants resources. Also, the young buds are so fragile that even the slightest bump can knock them off causing fruit loss. 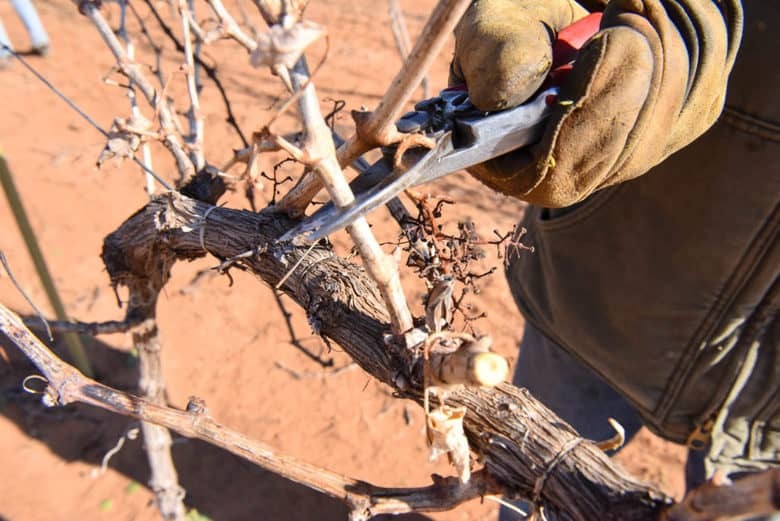 Pruning, whether it is with the pre-pruner, precision pruner or hand pruning, helps delay bud break. So,we like to start with the variety that buds out last because it has the least chance of being hurt by a late freeze. Below you can see a vine before hand pruning – it is Montepulciano that was planted in 2013. 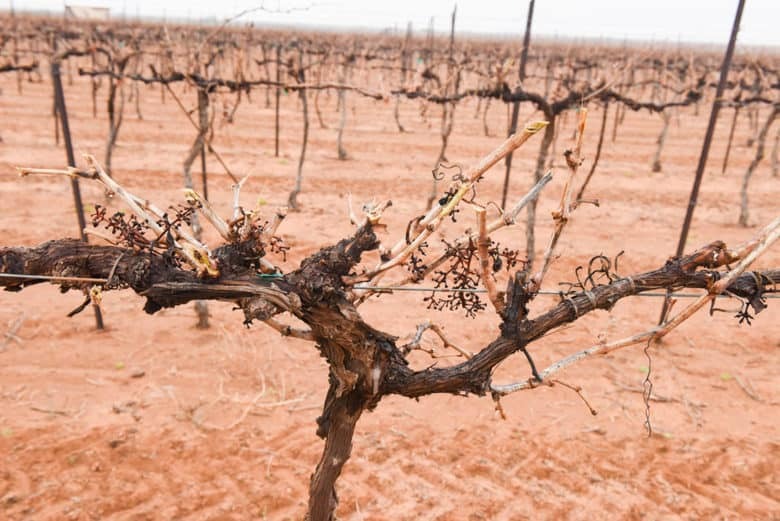 Now, you can see the same vine after hand pruning. What a difference! I love the cleaned up look hand pruning gives! 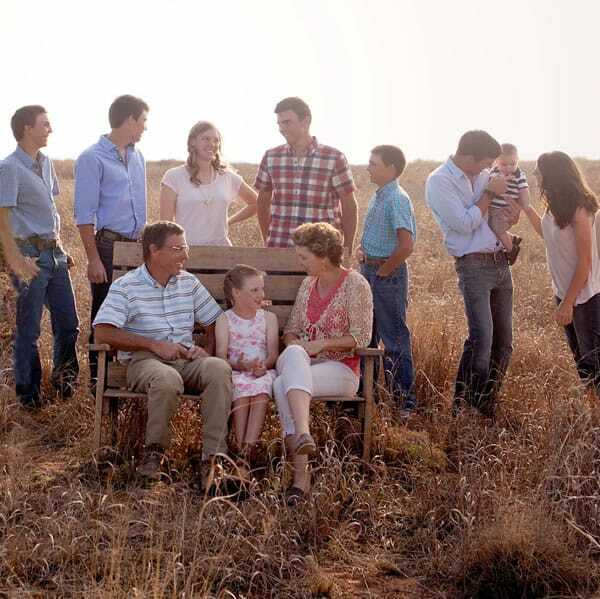 You might wonder how we choose what to cut off. Because Montepulciano is such a high producer, in the past we have pruned to 1 bud spurs which I will show you in a minute. 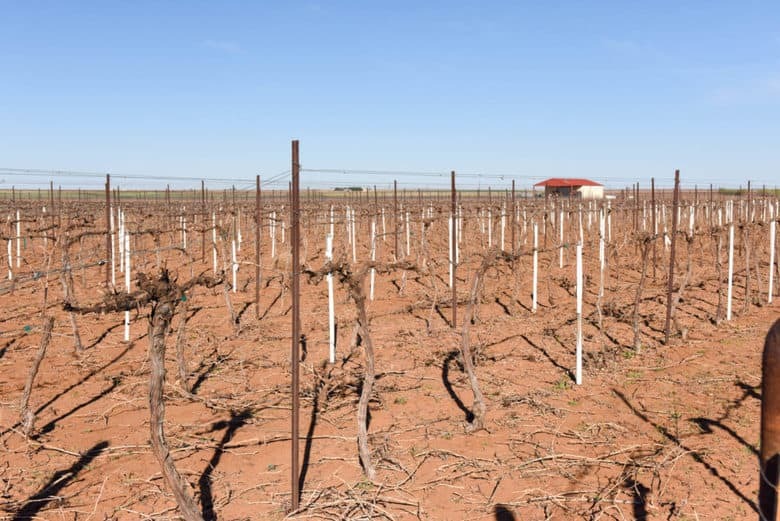 Last year we pruned much more severely trying to get the vines in optimum shape for the precision pruner (TRP). 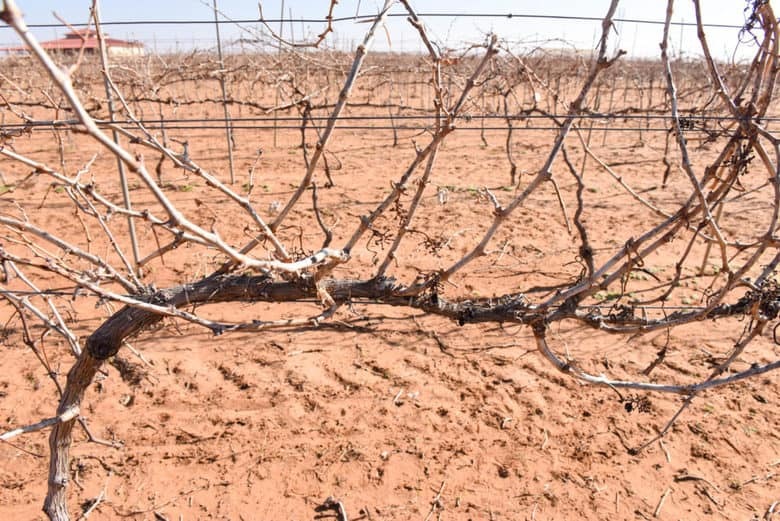 It is unable to “see” the spurs at the bottom or side of the vine so we cut all of those spurs out . We want all the spurs growing from the top of the cordon and growing up. This year, we are adjusting our pruning to get the crop load more accurate and leaving longer spurs and more buds where needed. On the left you can see a spur with dead wood that is to be cut off because there will be no fruit there. In the center you can see 2 buds and a basel bud. Since the dead wood spur will be cut off, we need to leave more fruitful buds in the center. We ideally want to have 10 buds per 2 foot arm. With 2 arms, each plant would have 20 buds. In the Montpulciano that will yield about 10 tons of grapes per acre. 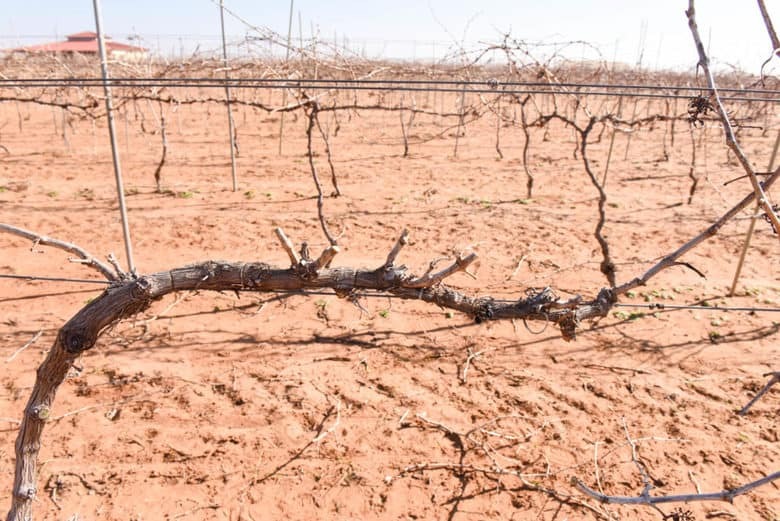 For the Roussanne and Aglianico it will be about 8 – 9 tons per acre. Here is an Aglianico grapevine before hand pruning. Being a goal oriented person, I love finishing projects and hand pruning is NO different! I love the clean look the vineyard has once it is completely pruned. For us, March is one of the busiest times of the year. 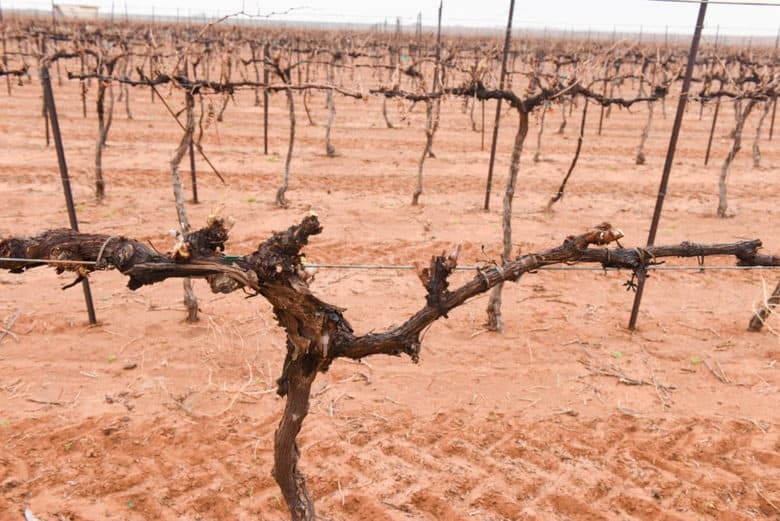 All our energy is focused on the vines, pruning and working as quickly as we can. How about you? What do you like to see finished? I am a goal oriented person too…..so I understand!! Charlotte, it is so nice to meet someone of kindred spirit!!!! !